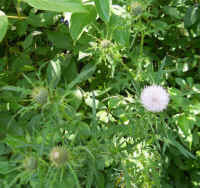 (Thistle, Bull - 01) The bull thistle is one of about 50 species of thistle known to exist in the United States. 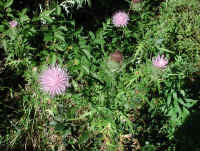 Bull thistle plants usually grow from three to six feet in height. 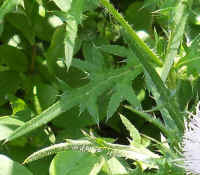 The bracts, stems, and leaves of the bull thistle are covered with sharp thorny prickles, which is one of the plant's characteristics. (Thistle, Bull - 01a) In this photo of the bull thistle, we can see a mature bract after the bloom has disappeared, and a smaller bract that is ready to send forth its flowery bloom. 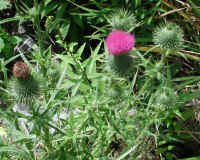 We can also see the winged stem with its small leaf-like projections, and the pinnate leaflets with their broad veins, which are even more pronounced from the underside and give the bull thistle its scientific name, Cirsium, which comes from the Greek word cirsos, meaning "swollen vein." The beautiful blooming flowers of the bull thistle are one of God's reminders of His presence, coming renewal, and hope for the whole of creation. (Thistle, Bull - 02a) Each one of these beautiful tubular projections in the bloom of the bull thistle is a separate flower. 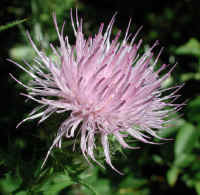 The bull thistle is a member of the Composite (former name) or Aster (Asteraceae ) family. 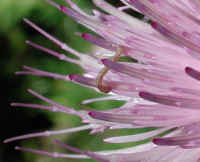 (Thistle, Bull - 02b) This is a bee's eye view of the opening central flowers of the bull thistle. 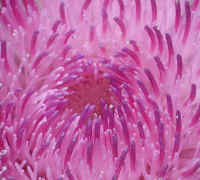 The heads of more flowers can be seen ready to push their way up to the surface and fill out the whole bloom. 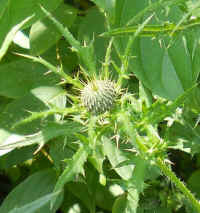 (Thistle, Bull - 03) The bull thistle is a biennial wild flower. The first year the plant produces a basal rosette of leaves and the second year it sends forth its flower stalks. (Thistle, Bull - 04) This bull thistle bloom has fully opened and has become somewhat "roughed up" by the weather and insects, which has aided the plant in pollinating. 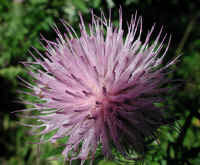 (Thistle, Bull - 05) This is another fully opened bull thistle bloom which appears to be in perfect shape. (Thistle, Bull - 05a) If you hadn't noticed on the previous photo, an uninvited guest had come to eat at the bull thistle cafe. (Thistle, Bull - 06) Another beautiful bull thistle bloom! (Thistle, Bull - 07) Bull thistle and other plants crowd together, just off the side of the road. 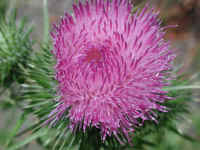 The warm juice from the crushed roots of the bull thistle was used to relieve earaches and toothaches. The nutritious roots were also eaten raw, boiled, or roasted. 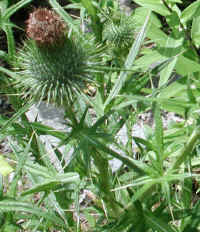 (Bull Thistle (Cirsium vulgare) - 08) This photo shows a bull thistle when it is just beginning to bloom. When fully mature they grow to heights of up to 6 feet. 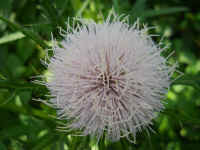 Even though this flower is a very light pink, we can identify it as a bull thistle by its thorn covered bracts. (Bull Thistle (Cirsium vulgare) - 08a) This is a closer view of the distinctive bull thistle leaf, which is an excellent way of helping to identify this wildflower. (Bull Thistle (Cirsium vulgare) - 08b) This is a closer look at a bull thistle flower bud. 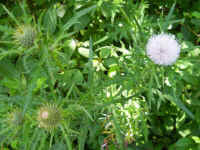 Bull thistles are native to Europe, but have now spread to almost all areas of Canada and the United States. 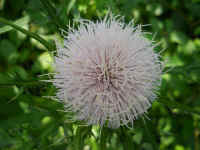 They are usually found in fields, along roadsides, and in waste places. 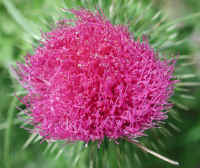 (Bull Thistle (Cirsium vulgare) - 09) This is a closer look at the bull thistle flower head and buds. (Bull Thistle (Cirsium vulgare) - 10) This is a closer look at a bull thistle bloom. (Bull Thistle (Cirsium vulgare) - 11) This is another look at a bull thistle bloom. 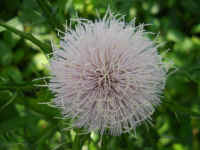 (Bull Thistle (Cirsium vulgare) - 12) This is another photo of a bull thistle bloom.